Dozens of grown men peered from behind the barred doorway of a crammed window-less prison cell, eyes pleading desperately from sweaty faces. Their physical discomfort was so palpable, I could almost feel it. Because of my work, I also knew of at least one serious unseen risk facing them – that of contracting tuberculosis in the cramped, poorly ventilated space. Touring the largest prison in Port-au-Prince was part of a research visit I made there in 2106. Two years later, the image of those men still haunts my memories—more so now that the first ever United Nations High-Level Meeting (UNHLM) on Tuberculosis (TB) approaches in September and the global spotlight gets set to turn on this neglected disease and conditions that continue to influence its spread. At the upcoming 22nd International AIDS Conference, in Amsterdam July 23 – 27, civil society organizations will seek to put the spotlight on vulnerable populations and deepen collaboration to ensure a united position on key issues such as the link between HIV/AIDS and TB and the need for an integrated approach to diagnosis and treatment. A special session, Friday, July 27, titled “Seizing the moment for TB: Current challenges in TB care and in TB and HIV integration,” will feature Eric Goosby, the United Nation’s Secretary General’s Special Envoy on TB; Paul Farmer, co-founder of Partners in Health; and Carol Nawina Kachenga, of the Zambian-based group CITAMplus. Former US President Bill Clinton will give the special sessions opening keynote. The scale of the prison problem is particularly staggering. In 2016, The Lancet published a study by Kate Dolan and her colleagues at the University of New South Wales explaining that of the total global incarcerated population of 10.2 million, 2.8 percent or 286,000 have active TB. A further 3.8 percent or 389, 000 also have HIV. The Stop TB Partnership estimates that, the risk of TB in prison on average, is 23 times higher than in the general population. The high rate of HIV in prisons is exacerbated by a lack of prevention options as well as sexual violence. However, even prisoners living with HIV who can overcome barriers to treatment, face a much greater risk of TB. Data from sub-Saharan Africa show a prevalence of HIV infection among prisoners from 2.3 percent to 34.9 percent and of TB, from 0.4 to 16.3 percent. Overcrowding seems to be the single biggest root cause of the prison TB epidemic. Dolan et al lay the blame on the practice of mass incarceration of people who inject drugs. They urge decriminalization, alternatives to incarceration, and access to opioid agonist therapy. Another driver of overcrowding is the use of pre-trial detention and the slow process of adjudication. Slow judicial processes have been blamed for the massive overcrowding in jails in the Philippines, a country with a high level of TB, including drug resistant TB. 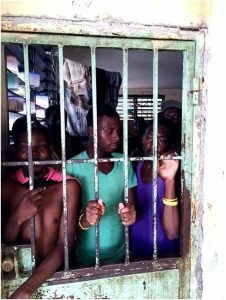 In Port-au-Prince, the National Penitentiary was built for 800 prisoners, but now houses 4600; the rate of tuberculosis is 17 times that of the general population of the country. There is no prison hospital in which patient can be appropriately isolated and treated. The prisoners are poorly fed, with only one or two meals a day and little or no protein, making tuberculosis – caused by an airborne bacterium- even more likely. The state of the world’s prisons ensures they are “factories” for TB transmission, including drug resistant TB—now the single biggest infectious disease killer in the world. Tackling prison conditions, therefore, is essential to ending the disease. Some countries are directly addressing the issue. Mongolia, for instance, reported a two-thirds reduction from 2001 to 2010 of TB among prisoners through active TB case finding and upgrading health services and living conditions. Reducing prison populations and improved nutrition was important to this success. In a project in Zambia, supported by TB REACH, peer educators have been trained from among the prison population to support TB screening as well as HIV counseling. This approach was found to be highly effective and sustainable, since the peer educators knew the prison culture and were enthusiastic and committed. Experts on TB also point to the need for screening and treatment, not only for active TB, but also for latent TB infection, which is very widely prevalent among prisoners, to support better TB prevention. TB preventive therapy, a course of antibiotics, has been proven highly effective but is still not widely used in high burden countries. At the penitentiary in Port-au-Prince, I saw the dedicated work of an NGO, Health Through Walls, to provide TB and HIV services, despite adverse conditions. With USAID and Global Fund support, they are providing HIV and TB diagnoses, including using the latest methods, as well as treatment and nutritional supplementation, in eleven prisons in Haiti. With a tiny budget, they are saving many lives. During a civil society hearing on TB held earlier this year at the United Nations, Assembly in preparation for the UNHLM, Donald Tobaiwa, from Jointed Hands Welfare Organization, Zimbabwe, called for urgent action to address TB in prisons, as well as in the mining industry. Advocates gathering at the UNHLM plan to make this their rallying cry to heads of state. With a strong commitment to finding TB cases, including those hiding in plain sight in prison populations, and support from member states for an independent and regular progress assessment, the meeting cane be a turning point in the drive to end this disease.